Waltham makes a very limited number of 17 Jewel Crescent Streets. 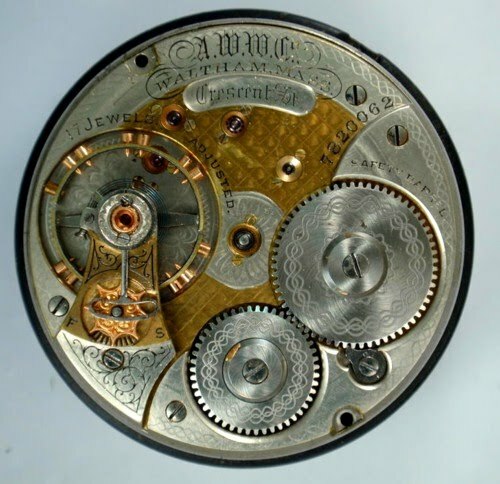 There are two variations, one a two tone movement which is quite unique and one in solid nickel. The two tone 17 Jewel Crescent Street is one of the more interesting movements that Waltham made. It was made by altering movements that were originally the Royal grade. 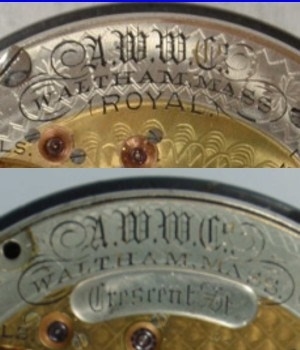 The alteration involved milling out the word "Royal" and inserting the words "Crescent St."
It is impossible to even guess how many of these movements were made. They occur in some of the Royal runs listed in the Gray Book and in two runs listed as 17-21 Jewel Crescent Streets that also contain Royals. They occur in only one movement variation with the serial number next to the barrel bridge and 2 barrel bridge screws. The tables below list all of the Royal runs listed in the Gray Book, the two 17-21 Jewel Crescent Street runs and the movements reported from each run. Serial End Royals 17J C. St.
Actual movements reported from run 782001-7821000 O.F. Actual movements reported from run 7819001-7820000 Htg. The Nickel 17 Jewel Crescent Street story is a short one. The movement only occurs in run 10042901-10043500 which is listed in the Gray Book as a run of 17-21 Jewel Crescent Streets. Four 17 Jewel Crescent Streets have been reported in the 10043301-10043500 range, suggesting that 200 of these movements were made.